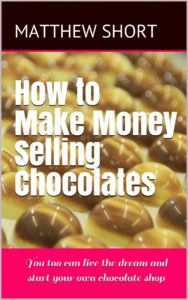 Three years ago we wrote a post on our website – How to Make money selling chocolates? It is one of the most popular posts we’ve ever written. Several times a month we are telephoned by people wanting to open a chocolate shop, wondering just how to do it – what equipment they need, how should they price chocolates? Usually as the conversation goes on and we talk about location, leases and product mix – we realise they’re making many of the fundamental mistakes we made when we first opened a chocolate shop and cafe in 2009. Over the past year we’ve written a book explaining our experiences of setting up and running chocolate shops and pop-up shops over the past ten years, with the benefit of us making the mistakes so you don’t have to! This isn’t a book written by a business consultant or bank manager, it’s written by us, people who remortgaged our house (with two small children around our ankles) and created from scratch an award winning chocolate shop listed in Time Out and Lonely Planet guides as the place to go. In this 173 page book you’ll learn just how we did it so you can too! This entry was posted in Business, Front Page News, Wholesale Information and tagged business, how to make money selling chocolates.